Whether we’re ready for it or not, winter is on the way. I was in beautiful, sunny Florida last week & they were experiencing record high temperatures so it was a little tough to step off the plane back in Saskatchewan to -3 weather. We don’t have any snow yet so that’s nice – nothing to shovel yet! 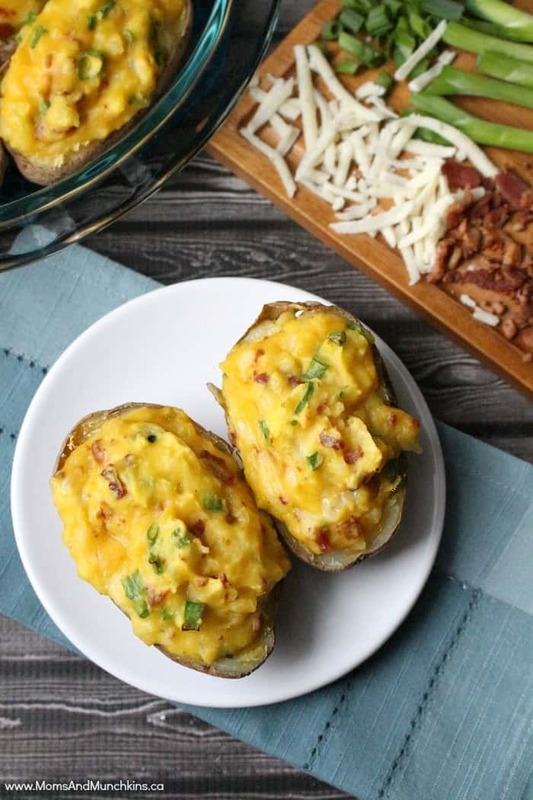 As the weather gets cool, I’m trading in my ice cream comfort food for warm choices like these Egg Stuffed Potato Skins. Comfort food doesn’t have to be unhealthy. Did you know that one local, fresh Canadian egg provides 14 important nutrients including vitamins A, D and E, folate, iron, zinc and choline? They are an excellent choice for a comfort food because they are both delicious & nutritious! When you buy Canadian eggs, you know you’re buying fresh, quality product because, thanks to supply management, Canadian Egg Farmers follow strict, details procedures for food safety & farming practices. I found this delicious Egg Stuffed Potato Skins recipe on the Eggs.ca website & just changed it slightly to add more sour cream, bacon, and cheese because my potatoes were large. They were so tasty! I shared with a friend & her family and they were a big hit over there too. Slice potatoes in half lengthwise; scoop out inside flesh of potatoes with spoon, being careful not to pierce skins. Combine potato flesh, eggs, sour cream, chives, cheese and bacon in medium bowl. Stir well to mix. Stuff potato skins with egg mixture. Bake in preheated 375°F oven about 20 minutes. This giveaway is open to Canadians only (18+ years of age), excluding Quebec. See the full rules here. I love how there’s so many different things you can do with eggs, each with their very own unique deliciousness. Yes! They are so amazing, I cant imagine baking half of the things I make without them! What I love most about eggs is the whites – high in protein and so filling to eat! I love that eggs pair with so many other foods!! They are delicious every single way you serve them up!! So versatile and I love it!! Eggs are nutritious, economical, versatile and delicious! I love eggs because they are delicious and nutritious. They can be used in so many ways to make delicious meals. Everyone in the family enjoys them. Hands down, the total versatility of eggs! The possibilities are endless with eggs & I love how they are packed full of vitamins. I love that you can cook them so many different ways and great for baking and cooking. What do I love about eggs? I love their versatilty. There are so many things you can make and do with eggs. You can have them on the side as part of a meal (scrambled, sunny side up, poached) or make a complete meal with them (kishe, omlette). You can have them for lunch, breakfast or dinner. Cook with them, bake with them or use them as a decoration. The egg is the best food to “play” with. I love how versatile eggs are! You always need to have eggs in the house! I love eggs because they are delicious and can be used in so many different recipes. my goodness what is their not to like about eggs? Whether eggs are the star of the dish or vital as a supporting role, EGGS ROCK!! I love how versatile, and healthy eggs are. I just made up some pasta topped with an egg, and it was great. i love eating eggs because they actually leave me full and satisfied until lunchtime. I love the versatility of eggs! They can be a breakfast, lunch, or dinner food, and are all equally delicious! I love that eggs can be used for all kinds of dishes, even desserts! I’m a huge fan of omlettes! Eggs are just so versatile. I love their versatility. And I love egg nog. How can anything that creates egg nog be a bad thing? I love them because they are such a healthy way to start the day and there are so many ways to cook them up. M y favorite right now is egg muffins! They are easy to cook and filling and I always have them on hand.. I like the taste of eggs and how they can be used in so many different ways. I love that eggs are so versatile in cooking. I absolutely love eggs scrambled, poached, hard boiled. You name it! It’s a much easier way for me to get protein as opposed to cooking red meat since I only cook for 1 most of the time. I love how you can do so many things with eggs and they taste great! I love how eggs hold things together. Without them there would be so many dishes we wouldn’t be able to make. Eggs are good for you, inexpensive and versatile! I love that they are so easy to use in so many different ways. I love all the wonderful things you can do with eggs. I love how fast and easy they are to prepare and how many ways there are to use them. I love that I can whip together an egg main dish meal much faster than meat meals. It is a life saver on the time starved nights. I love that eggs are so versatile both in the variety of ways you can cook them by themselves and what you can make with them as an ingredient. Definitely one of my favourite foods! I love how easy eggs are to prepare. I love how yummy they are and how versatile they are. I can make scrambled eggs with cheese which is my current favorite or I can add a sunnyside up egg to my burger yum! Or i can make fried rice…..oh te possibilities! I love the softness of scrambled eggs. They melt in your mouth. I like that you can use them in everything, and that they’re so easy to cook. I love how you keep up to date on everything and make things simple. I love the taste, the fact that they are high in protein and that they are very versatile to use in recipes. I love that eggs are an excellent low-calorie protein source. Eggs are my go to ingredient and meal… When I was young and poor (while in university), they were a cheap meal and good source of protein. I still love them for their versatility as an ingredient: you can use them in baking, in savoury dishes and on their own. They are also full of protein and nutrients and soooo delicious! I love how there are so many things you can do with them, and different flavour combinations. I love eggs because they are tasty, easy to cook, and loaded with protein! Eggs are affordable, they are super versatile and are just the right ticket for a quick and easy go to meal for the whole family. I love how versatile eggs are and how nutritious they are. I love that eggs are a relatively inexpensive protein option, they are versatile and easy to prepare! SO versatile and beneficial to your well-being. I love eggs because they are gluten and dairy free. We don’t not eat gluten or dairy so eggs are a life saver! SO HEALTHY AND DELICIOUS ! I love all the different ways you can use eggs to cook. I love everything about them. So versatile! I love their versatility, and how much protein they pack. A boiled egg is the perfect snack when I’m on a diet. I love how many things I can do with eggs! Super yummy! Not only there are hundreds of thing you can do with eggs but they also eggs have 6 grams of high-quality protein and that a protein packed breakfast helps sustain mental and physical energy throughout the day. I love that eggs are so comforting at any time of the day. Depending how you make them, they’re good for breakfast, lunch, or dinner! Eggs are so versatile and can be eaten and used so many ways. I love that the possibilities are endless as to what you can do with an egg! I love that it is a good source of protein and is delicious! Eggs are full of protein and make me feel great. I like that they have protein and are low in calories. I love that you can have eggs for breakfast, brunch, lunch or dinner! I like how eggs are so versatile. They can practically go in anything and they are so good for you!!! I love the versatility of Eggs. I love eggs, especially Egg Salad Sandwiches…..
Eggs are so versatile, you can eat them anytime of the day from eating it as an ingredient in something or alone or as part of a meal. Also they are good value and can feed a family with no problem. Eggs are so versatile – anything from desserts to main entrees. I would freak out if I didn’t have eggs in my kitchen. Also, they are simply delicious. I love how easy a protein packed snack they are for myself and the kids! I love how many different ways I can prepare eggs. I like how much protein eggs contain and all the different nutrients they have in them are great. I like that eggs are so versitile, Also a great sorce of protien. I love that they are a good source of protein. I love that eggs can be a great meal any time of the day. Great for breakfast, lunch and supper. Reasonably priced and a good source of protein. I love that eggs are healthy, decently priced, taste so good & are versatile!! I love that eggs are a good source of protein and are quick and easy to cook! I love that they are part of a fast yet nutritious breakfast for my kids on school days. Eggs are all they’re cracked uo to be! Seriously, they are nutritious and versatile. I love the multple options eggs present! I love that eggs can be a meal on their own or they can be incorporated into just about every meal! I love how many I can make them & they cook so quickly! I like eggs because they are healthy and can be made in so many ways. Never boring. Love eggs, breakfast, lunch or dinner and desserPoached, hard boiled for an egg salad sandwich, making a quiche, meringue cookies. Eggs are staple in our household from fast to fancy, you just can’t beat them for their versatility. I love the Huge Jumbo Eggs, but most of all I love about eggs is eating them!!! I have them every night!! I love that eggs are a great source of energy and protein, plus very versatile! I love that there are so many options to cooking eggs! they are so fast to cook. I love eggs because they are so easy and quick to cook. They are my staple meal on a quick lunch break. I love that there is so many things to do with Eggs and it is one food my entire family loves! Eggs are so versatile, we use the, for everything that’s why I like having them in the house. For baking or a quick dinner or breakfast! I love that eggs are incredibly versatile in my daily menus. They can be used at breakfast, lunch, dinner, for snacks etc. etc. I love what a great source of protein they are and how versatile they are! I love all of the different ways you can prepare eggs and use them in recipes. So delicious! I love eggs because they are so affordable, versatile, filling and comforting. They are also great when you need a quick, easy meal (breakfast for dinner is one of my favourites). I love eggs because they taste delicious! I love eggs because we can do so many things with them that are so delicious! I love how they are a great protein and great for a nice hot breakfast. Besides the taste? I love the nutritional wallop that eggs pack! I love that eggs are protein packed and so versatile! I love eggs because hard boiled eggs go great in a salad. I love that they can be used in breakfasts, lunches and dinners – they are so versatile. I love the flavour of eggs, their versatility, how quickly they are to cook and that they are a source of protein. I love eggs because there is so many things you can do with them, recipes galore or just eat them by themselves! I love that it is easy to cook! I love eggs since they are so versatile as they can be prepared in so many ways and they are affordable and make a portable handy on the go snack. I love that eggs are so versatile and are so useful in many different dishes. I love how versatile they are…and that my kids love them. I love that eggs are so versatile! There are so many ways to cook them, and adding them into a recipe holds things together! I like their versatility — good for any meal. I love eggs because they are high in protein but low in carbs! I’m a vegetarian so it is very difficult for me to find sources of food that are high in protein without being totally full of carbs. Eggs are the best!! They are cheap and delish . I love that they can make many different dishes just by cooking different ways . I love that eggs can be cooked so many different ways and that they are so high in protein. I love eggs because of the protein value, and that it can be cooked so many different ways which makes it so ideal, and nutritious meal. I love eggs because they are healthy, nutritious, a high source of protein, and taste great. Eggs are easy to cook, and quickly so it makes for fast but healthy way to start out our mornings. I love that there are so many egg recipes that you can’t get bored with eggs. I love their nutritional content ( a full protein) and their versatiity in both baking and cooking dishes! Yum! It’s the ultimate comfort food for me & so nutritious. They’re so versatile! So many different ways to cook them. They yolk is my favourite part! I love how essentially they are so important to a healthy diet and how versatile they are.They are high in protein and low in carbs and can literally be incorporated into so many delicious and appetizing recipes.Eggs are awesome!!! the are yummy any way you make them! Eggs are a great source of protein! especially for someone who doesnt eat much meat like me! plus i love baking and eggs are used in almost every recipe! I love eggs! And I mean the WHOLE egg…none of this just egg white business. They are a staple in my kitchen. I absolutely love the energy boost I get after eating eggs! I love that they lead to Eggs Benedict, the most delicious breaky ever. I love the versatility, whole nutrition and convenience of eggs! I love how quick they are to cook and how extremely versatile they are while packing an awesome nutritional punch. I love that eggs are quick and easy to prepare. If I can’t think of anything for breakfast, I just throw a couple eggs in a pan! I love the smell of them frying and I love the taste!! You can make an omelette with just about anything. And even if you don’t have anything else, eggs are nature’s perfect food. I love how healthy eggs are! So much protein! I love how sometimes the eggshell comes off perfectly on a hard boiled egg. I love that eggs are a quick breakfast in the morning. I love eggs because they are healthy, satisfying and delicious! The family eats eggs like it is going out of style. I love eggs because they are great for a source of protein after a workout. Cheap and easy and kids like them- my fav about eggs. I love the variety of uses eggs have! I love that eggs are simple & quick to make and delicious! I love everything about eggs! I eat eggs almost every single day, whether it’s fried eggs, egg salad sandwiches, or a delicious omelette. I love how versatile eggs are and how they always taste good no matter how they are prepared! Eggs are my favorite quickie meal, especially with bread and cheese.